Pile-up Accidents: Who’s at Fault and What Are Your Options? With 3,000-pound hunks of steel and plastic careening off each other like they’re in a pinball machine, a multiple car pile-up is one of the most frightening and destructive events that can occur on the road. Unfortunately, these crashes are all too common, especially during the winter: a USA Today analysis last year found that 57 reported pile-up accidents occurred between November 2014 and March 2015 in the United States. The Baltimore area is no stranger to pile-up accidents; last October, for example, 13 vehicles crashed—including a tractor trailer that jackknifed—on the Baltimore beltway ramp to Interstate 83 sending eleven people to the hospital with non-serious injuries. In terms of vehicles involved, though, 13 is a small number compared to the enormous pile-up that occurred in Michigan last year: The fiery January 2015 crash near Battle Creek involved 193 vehicles, killing one person and injuring 23. Experts agree that adverse weather, reduced visibility, and people driving too fast for conditions all frequently play a role in Maryland pile-up crashes, but otherwise, very little research exists about these massive multiple-vehicle accidents and why they occur. Neither the Federal Highway Administration, the National Highway Traffic Safety Administration, the National Transportation Safety Board, the Insurance Institute for Highway Safety, nor motor club AAA has published reports or statistics about these types of crashes. 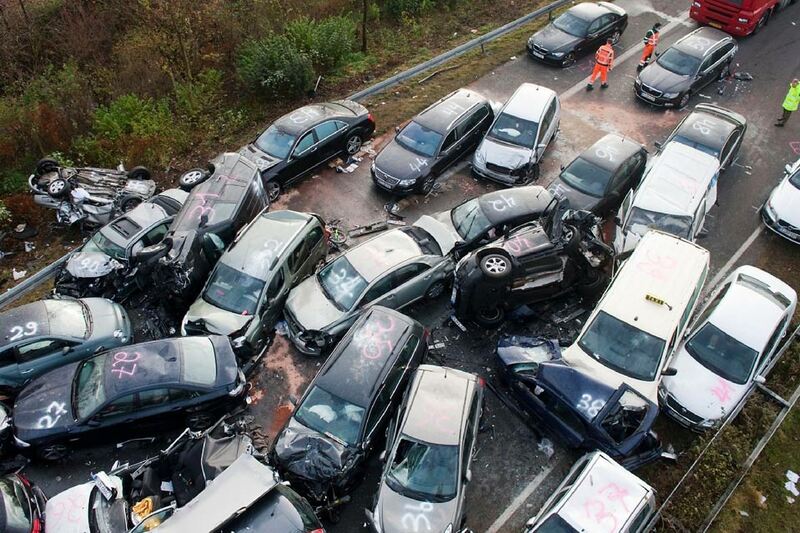 Data regarding pile-ups is hard to come by, as most organizations classify car accidents as either “single-vehicle” or “multiple-vehicle” events, with no special classification for crashes involving a large number of vehicles. With so many drivers involved, determining fault in a pile-up accident is rarely easy. While the driver whose actions initiated the pile-up obviously bears responsibility for the crash, it’s possible that other drivers’ actions made the pile-up worse after it was already in progress—for example, by driving too close to another vehicle or driving too fast for conditions. These actions may have, in turn, led to more vehicles becoming involved and greater damages. The liable party (or parties) for a pile-up accident, then, can range from being a single driver to being all of the drivers involved in the crash. Generally, law enforcement officers will take notes and conduct interviews to establish the position of each and every car, the actions of all drivers, and any weather or environmental conditions that contributed to the accident. The resulting police report will often make a conclusion about which driver or drivers were at fault. In addition, insurance adjusters may also begin their own independent investigation(s) to determine and report about who was at fault. In the case of especially large pile-ups, law enforcement may employ special investigative teams that are trained to analyze the often-confusing mass of evidence. While these special teams are highly qualified and can use engineering-level physics and computer modeling to dissect a crash, their investigations often proceed slowly and can go on for months before a report is published. What Should I Do if I’m Involved in a Pile-up? If you’re involved in a pile-up accident with multiple vehicles, it’s important to stay calm and follow a few simple steps at the scene to stay safe and establish the facts of what happened. Stay in your vehicle with your seatbelt fastened until law enforcement or emergency medical personnel direct you to get out. Make sure everyone else in your vehicle does the same. There is often a possibility that another vehicle could crash into the accident site, so standing outside your vehicle can be extremely dangerous. Put your hazard lights on to increase your car’s visibility. After responders have directed you to exit your vehicle, gather any information that you can at the scene while still ensuring your own safety. This can include taking pictures of your vehicle and the accident scene, obtaining contact information from other drivers and witnesses, and writing down notes about what happened while the events are still fresh in your mind. You should also take photographs of witnesses’ license plates or make copies of their driver’s licenses if they are willing to let you do so. Witnesses can be hard to track down and phone numbers change, but we can always run a search for their license or tags. Cooperate with police and answer any questions they have for you truthfully, but stick to objective facts about what happened. Don’t make any statements admitting fault, and don’t try to establish fault in statements to the police. Get a copy of the police report at the scene, or ask a responding officer how you can obtain a copy later. Contact your insurance agent immediately to notify them of the accident, but do not give a recorded statement without first consulting an attorney. See a physician as soon as possible to receive treatment for any injuries and get a full physical examination. Even if you don’t think you’ve been injured, it’s important to let a doctor evaluate your condition in case there are injuries or other health consequences from the accident that aren’t immediately apparent. Consult with an experienced personal injury attorney as soon as possible about any potential claims arising from the accident. If you or a loved one has been involved in a pile-up or any other form of motor vehicle accident, please contact the legal team at Pinder Plotkin. Our attorneys have the qualifications, experience, and capable support staff to investigate your case and get you the compensation you deserve. For personal injury claims, our contingent fee policy ensures that you will not pay a dime for fees or expenses unless we achieve a financial recovery for you. Please call us today at (410) 661-9440 or visit our website to receive a free consultation regarding your case.